I can safely say that almost without exception, my taste for the finer things in life waited until I was well past childhood to come out of hiding. In eschewing just about anything that might impart an ounce of nutrition, by the time I turned ten most people assumed I was well on my way to a permanent place in the junk food hall of fame; after all, my principal yardstick for edibility was based on sugar and cheese, with occasional allowances for other things as long as they were drowned in enough ketchup. I’m sure most people who knew me had already written me off as a lost cause, thinking I was doomed to a life of fast food and Velveeta; I might well have been if it weren’t for a sudden explosion in my tastes that happened around this time. I owe it all to pesto. I can thank my father, the man better known for his affinity for certain members of the gourd family, for introducing me to pesto. At some point in my childhood he started shopping at one of Oakland, California’s most esteemed purveyors of Italian food, the Genova delicatessen. Every time he went he came back loaded with boxes of their homemade ravioli, softly misshapen and bulging with cheese. I was more wary, however, of the pint-sized containers of vivid green sludge that he also brought home, especially as they filled the room with an indescribable pungency the instant the lid was taken off. The abbreviated ingredient list specifying ‘extra virgin olive oil, fresh basil, parmesan cheese and garlic’ was the only indication of their contents, but at that point it might have been written in Italian for all these fancy words meant to me. I’m not sure what force moved me to try it the first time (it certainly wasn’t its color – I had an almost religious aversion to anything green), but that one taste was all it took: by the time the first spoonful reached my stomach, I was a pesto convert. What I didn’t know at the time was that I was developing a taste for a pesto with a pedigree, and I would have to wait years until I tasted anything again that would live up to it. It’s really no wonder this pesto wormed its way into my heart the way it did. The birthplace of basil pesto is the Ligurian coast of Italy, whose capital city is Genoa, or Genova in Italian. Genoa is widely regarded by Italians as being the only place in the country to sample authentic pesto, but I hadn’t realized just how significant this was until I found myself there years later. At this point it was probably at least seven or eight years since I’d last tasted pesto from the Genova delicatessen, and the intervening time had been filled, on the pesto front, with incalculable mediocrity. As pesto had caught on more popularly in the U.S. I’d tried every mass marketed supermarket variety and restaurant version I could get my hands on, but it all paled in comparison to my memories; I’d had some decent results making it myself, but no matter how many ‘authentic’ recipes I tried, it never tasted quite right. I had even started to doubt my own memory, thinking perhaps the rose-colored glasses of hindsight had made me remember a taste that never existed. Then one day on my first backpacking tour of Europe, I was traveling by train along the west coast of Italy, and I had to change trains in Genoa. Realizing as I disembarked that I had half an hour to kill before my connecting train arrived, I wandered out of the station and found myself on the doorstep of a small supermarket. I stepped inside, grabbed a loaf of bread and some cheese, and was about to leave when I passed a refrigerated case that contained nothing but small plastic containers of emerald green paste. They had no label, for it was assumed everyone would know what these contained; I grabbed one and headed back to the station. If Proust’s moment came in the form of a madeleine, and Nigella’s came in the form a cheesebread, mine came in the form of this pesto, on a rickety train making its slow path down the coast to Portofino. With one bite my doubts about my recollections were erased – I had never known a simple taste to bridge space and time so seamlessly. I can’t even tell you exactly what it was that made it perfect, but there was a freshness, an intensity and a creamy pungency that had been lacking in every other pesto I’d tried over the years, and just inhaling its fragrance transported me back to my father’s kitchen in California. I briefly wondered whether all pesto in Italy would be this good, but was soon to discover it wasn’t; in fact, in most parts of Italy the pesto can be as bad as bad pesto anywhere. A few weeks later, an interesting conversation with a hostel owner on Lake Como clued me in to why. We had gotten to talking about the differences between regional Italian cuisines, and I described my experience with the Genovese pesto. He smiled knowingly and replied that a true Ligurian pesto cannot be perfectly replicated anywhere else because of the quality of the basil. The soil around Genoa, he explained, contains a particular mix of minerals that create a basil that is both spicy and delicate, without the harsh grassiness that characterises basil elsewhere. The Ligurians also know how to grow their basil to its maximum potential – it’s always shaded from direct sun and picked before the leaves get too large and tough. I must have looked dubious because he asked his wife to whip some up that evening from the basil growing in the hostel’s garden; when he brought me up a sample to taste I had to agree that although it was very good, it was still a far cry from the Genovese gold standard. I could give you a recipe for basil pesto, but it would be futile. You see, unless you happen to be looking out your window on a field of tender Ligurian basil, my recipe won’t get you closer to the real thing than any other recipe. In some ways I regard my uncompromising taste for true Genovese pesto as a handicap; in most situations I would rather not eat it at all than be disappointed. Then again, it has also been something of a blessing, as without this desire to avoid disappointment I never would have started experimenting with other kinds of pestos. As it turns out, chunky herb and nut sauces are made all over Italy, and despite the fact that the basil variety has become the darling of the international dining scene, there exist countless delicious versions incorporating every kind of herb and nut imaginable. I give you, therefore, two of my favorites that you shouldn’t have any trouble reproducing wherever you are. For my part, I still dream of returning to Genoa one day to reconnect with the pesto of my dreams, but with alternatives as good as these, you can be sure that in the meantime my ravioli isn’t going to go naked. rpower some of the other flavors, I was so glad I didn’t – the mint adds an underlying note of freshness to the basil that beautifully compliments the rich profusion of nuts. Also note that there are versions of this pesto that contain cheese, but I prefer this one without as there are already so many subtle and complex flavors vying for your attention, and the nuts make it plenty rich without. Preheat the oven to 350F/180C. Begin by toasting the nuts in separate batches on a baking sheet just until golden and fragrant, about 10-12 minutes for the almonds and hazelnuts, and 7-9 minutes for the pistachios and pine nuts. (If you think you’ll be vigilant enough, you can stick them all in the oven together in different pans, removing each kind of nut as it turns golden.) Set them all aside to cool. Using a towel or moistened hands, rub the skins off the hazelnuts. Combine everything in a food processor (or a mortar and pestle, if you like things done the old-fashioned way) and pulse until reduced to a slightly chunky paste, adding more oil if necessary. Taste for salt, then store in a covered container in the refrigerator for up to a week. You can use this as a sauce for pasta, or as a topping for fish, chicken, vegetables, or foccacia. It also makes a killer sandwich spread. Notes: While the above pesto is fragrant, herbal and fresh, this one is gutsy, punchy and robust. It goes well with just about everything, including stronger flavors like red meat and pork. When I use it for pasta, I have no qualms about showering this one with copious amounts of cheese. Combine everything in a food processor fitted with a metal blade and pulse lightly until a chunky paste is formed. Taste for seasoning, correcting the balance of salt, sugar or vinegar if needed. Keeps covered for at least a week. See above recipe for serving suggestions. Well… That was a really nice post, as usual. I don’t think I ever had anything remotely resembling the ligurian pesto you evoke so beautifully — alas. But your substitutes look awesome. Thanks ! I’ve had the exact same experience!!! I spent a few days in Cinque Terre, right off the Ligurian Sea, and after one bite of that pesto nothing’s been the same since. I kept hoping that you’d have the magic recipe at the end of the post, but I think you’re right — We’ll just have to go back to the source. And yet another wonderfully informative post with a vibrant picture! I’ve been twice to Sapri and Maratea in the South, where I’ve always bought jars of wonderfully cheesy & spicy red pesto alla calabrese. 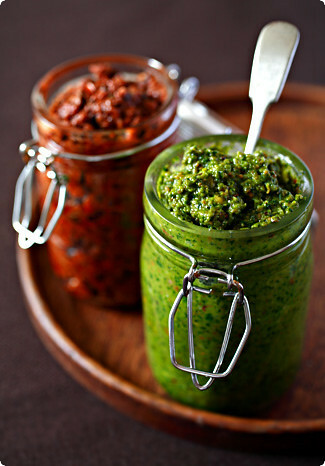 Now I have another two pesto recipes to try..
hi melissa, beautiful post and gorgeous picture! it’s funny how it’s the simplest of things that are the most difficult to transplant and replicate beyond their birthplace.for some strange reason, reading about the pesto rosso has made me crave some catalan romesco! A beautiful story and photograph! I truly do not know why Genovese basil is so famed. I’ve eated the pesto, it was out of this world but I wonder if it is a different species of the herb. Maybe it’s like vitello albese, a special breed of cow that is raised only in piemonte, if you have had veal tartar cut by hand you will know what I mean.I really have to do more research…Thanks for a great post and I have to get down to Sicilia to sample the nut pestos firsthand. basil, mint, nuts and garlic. all of the best ones are here…. hazelnuts, pine nuts, pistachios… it sounds incredible.I have one particular gripe about this recipe, and that is nothing to do with the food in particular – you see, basil gives me heartburn. when I taste pesto in sandwiches, I know I’ll suffer later. Sometimes it comes as a "surprise", they sneak some in, or there’s basil in the olive paste or whatever… So I eat and stock up on "tums". Am I the only one who gets this indigestion thing from basil? Hello Melissa,I am glad to be back to find such a lovely post to read. As I read about the Ligurian basil, I close my eyes and feel the sun and the scent around. Since I am just back from summer, I have no troubel imagining I am almost in Italy!Your picture, the green and red jars are so inviting! Like anyone back only for a few hours, I have little clarity to know what to cook. I wish I could just dig in these pesto pots! Grrrrr! Glad to read you again! NZ was amazing as expected!!! What a delicious post. I was really lucky when I was in university. My flatmate (my final year in school) was obsessed with making really good pesto. He’d make huge quantities of the most delicious pesto, eating some right away and freezing the rest. Of course, I stole it as often as I could.My favorite pesto and way of eating it is a coriander-basil pesto spread over a nice steak–a la Peter Gordon’s famous dish from Sugar Club.Beautiful pictures as always. Gorgeous contrast and detail. Melissa,There is nothing better than a freshly-made pesto with basil that has been just picked and is still warm from the summer sun.We are still working our way through another long Canadian winter … but this post has made me think that Summer is not that far away!Merci! I love Genova too! Both the deli in Oakland, and the city in Italy. But only had pesto in the sea-side city (in Italy) since I don’t think I can ever get enough of it. Genoa is amazing and really worthy of more than a 30-minute stopover. At least you were saavy enough to grab a taste, on the run. Your blog is beautiful, so "esthétique" (sorry, I’m French and I’m not sure aesthetic has the same meaning). Thank you for such beautiful pictures and, apparently, great recipes. The first time I tasted pesto was on my sister’s homeade pizza. Now we put it in so many recipes. We can’t wait to try making one of these before I move to Germany. I think I’ll have to take a cooking class over there because I won’t have all my family to observe and someone "keeping an eye on me" so I don’t burn the house down. Thanks again for the time you take to share your stories and inspirations along with the recipes. These do look and sound like the essense of summer.Your photography is super-I love the textures and surface lights. You’ve cheered up my cold and snowy day. Fabulous pictures and lovely post, but I have a question… I noticed that you took the picture inside jars used for storing thing, I was wondering if this means that your pesto will actually last a while? Do you know how long? I would love to whip up some pesto even if finding the ingredients here could mean a month long quest, but with only 2 people in the house it would be great to know how long I might be able to use it for. Thanks! My friend insisted me on learning to make pesto sauce. Just by reading these comments I think I understand why and I am quite sure that I am going to love it too!Just one thing is bothering me:isn’t it dangerous to use so much of cheese and nuts for the people who already have an overweight problem?Actually: is it really possible to loose weight by eating Italian food as in most of the dishes they use cheese? Melissa,Can one make the pesto rosso without the almonds? My roommate and I are having a dinner (and we wanted to make it easy, but good, so I thought pesto! ), but one person is allergic to nuts. Do you have a substitute for nuts??? Thanks! I love your site and one day, I will finally get around to trying all the lovely recipes, mmmmmm. Michelle – Hmm, hard to say what to substitute. Maybe something creamy, like some goat cheese? Then again, you could certainly just leave them out – it’ll be a different sauce, but no less tasty, I’d imagine. Good luck!